Wake Up Now Review - Is There Hope for Success? There are numerous home based business opportunities for budding entrepreneurs. In fact, such opportunities keep popping up every single day. With a lot of business opportunities to choose from, it can be really difficult to decipher all the important information. You are obviously here to take a closer look at the Wake Up Now business opportunity. Well, this Wake Up Now Review will provide you with the information that you are looking for. In this Wake Up Now review, we will help you understand this MLM marketing company. We hope it will help you make an informed choice about this business opportunity. It is worth mentioning that we are not a Wake Up Now affiliate nor do we distribute the products or promote the business opportunity. Wake Up Now was founded by Troy Muhlestein in 2009. He is a former corporate leader in conventional business. The company has its headquarters in Provo, Utah. This place has always been popular as the MLM capital of the world. According to the founder, Wake Up Now provides customers with life-changing software solutions. The company was founded when Troy lost his job and wanted to pursue something new and he managed to come up with something new in deed. When the company was founded, it was based on the principle of helping others. The company was born with a basic idea that every distributor should have equal opportunity to earn more money. This was quite different from most conventional MLM marketing plans. Wake Up Now’s primary motive was to help struggling families in America. Wake Up Now has dedicated itself to help people find legitimate ways to handle their financial hardships. This company is about preparing for your future, earning rewards, tracking your progress and generating some extra profits every month. In August 2013, Wake Me Up was the fastest growing MLM company with over a 600% gain. As mentioned earlier, Wake Up Now offers some exceptional software solutions. They provide these solutions with a proprietary software program known as HUB. 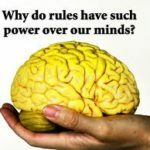 If you keep wondering about the products offered by this MLM company, keep reading this Wake Up Now review. HUB is a web-based search tool. It helps you find various deals on almost everything you can imagine. These include vacations, household products, entertainment options and even local deals. You can just imagine how good it would be to get paid for purchasing products that you use regularly. HUB also includes some financial tools that can help customers use the money they save on certain purchases and apply it to both debts and achieve financial goals. If you want to earn commissions from the company, you need to be a qualified independent business owner. In order to become a qualified independent business owner, you need to enroll yourself with the company and achieve 90 Personal Volume. One of the best part about Wake Up Now is that you don’t need to sell products to earn 90 Personal Volume. If you sell any combination of services and products to customers or purchase them for personal use, you will be eligible. Wake Up Now compensation plan offers a lot of different ways to earn a good commission, including team payouts and retail payouts. One major difference between Wake Up Now and other companies’ compensation plan is that the Team Payout is fixed at $10,000 per month. This helps IBOs focus on assisting their team members create successful leads. A detailed report of the Wake Up Now compensation plan is available on the official website of the company. I always recommend that any potential business owner should check out the income disclosure statement of any company that they are considering. In the case of Wake Up Now, I am very concerned about what I see. 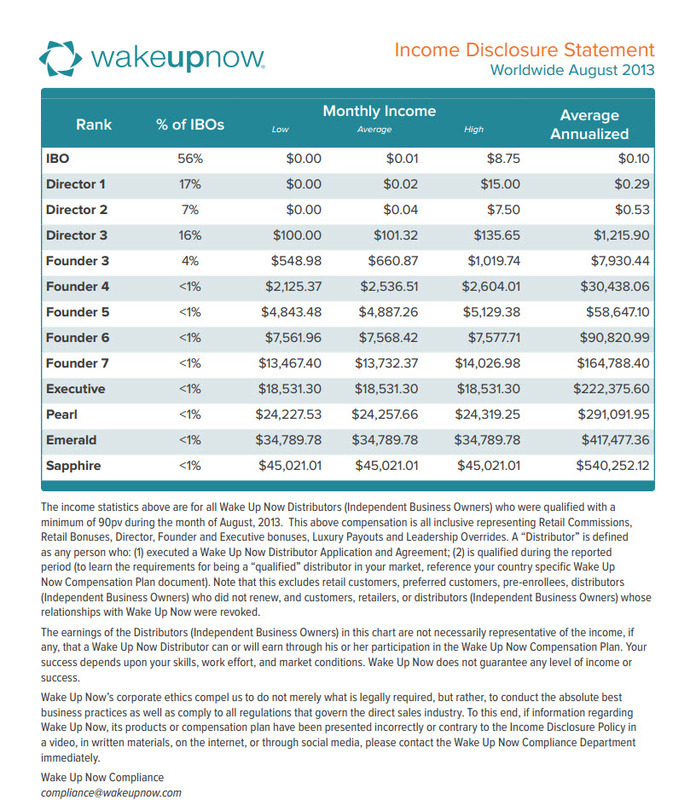 96% of Wake Up Now members are making $1,200 per YEAR or less. Not impressive. Two ways to look at that – the compensation plan pays a very small portion of each sale so a VERY large team is necessary to make an average amount of money OR the current affiliates are just not working the business and building a team. Either way, you need to carefully consider the income potential based on the Income Disclosure Statement. Wake Up Now Review – Can You Really Earn Money with Wake Up Now? Like every other MLM company, nothing can guarantee your success with Wake Up Now. In order to achieve success with Wake Up Now, you will have to work very hard and generate more leads. Just like this Wake Up Now review, you will have to go through various tutorials, videos and guides. This can be quite frustrating for some people. However, if you work hard and keep making efforts, you’ll eventually achieve success. You just need to define what is “success” for you and what it will take to get to that level. If we talk about some problems related to the company’s compensation plan, there’s one subject worth talking about. Compensation plan of Wake Up Now is like a hybrid binary matrix. Therefore, it will pay you just 10% commission for the volume. Most online marketers who’ve had experience with such marketing plans don’t consider a binary matrix to be very effective. Another major problem is that your earnings are capped. Most people like to get paid more if they’re working more. However, Wake Up Now offers some good bonuses which can help you make up your mind. Moreover, in a short period of time, the company has built up a strong reputation. It’s obvious that they’re doing something right. Wake Up Now Review – Should You Invest Your Time and Money? Wake Up Now is a business organization that has always aimed for unity and camaraderie of members. Everyone works in a team to help other members reach their dreams and achieve their goals. People teach each other some effective marketing techniques to earn more money with just a few dollars as an investment. If you already know how to get attention and generate leads, this might be the best MLM company for you. You will be able to become a leader and organize a team. In simple words, Wake Up Now can be a very good business opportunity for people who want to earn from a home based business. You will be able to earn some good commissions, make new friends and practice your skills as a team leader. Wake Up Now does not make any false claims or promises to help you make instant money. However, the company guarantees your success if you follow their marketing training and advice. In order to know a lot more about the company, you should visit its official website. Just like this Wake Up Now review, there’s a lot of information out there which you can use to your benefit. Wake Up Review bottom line is that this is another network marketing company offering software to help you save money on items including vacations, household products, entertainment options, etc. According to the Wake Up Now Income Disclosure Statement 99+% of the people do NOT make a significant income as distributors of these products. Truth is in most network marketing companies MOST people will never make enough money to even cover the cost of their monthly fees. Is this the fault of the company or opportunity? Most of the time the answer is NO. It is because most people really have no idea what it really takes to build a profitable business either online or offline. Once people have exhausted their family and friends, they drop out or struggle for a very long time. MOST people don’t have a clue how to MARKET. Before you join any company, you need to have a plan or system that can lead you to the success that you are seeking. 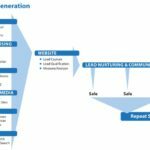 The key to any marketing plan or system is generating leads. CHECK OUT the lead system we use. It is the total package and may just give you what you are looking for. I hope that you benefited from this Wake Up Now Review. Leave your thoughts and comments. Order a Kit Today And See How! 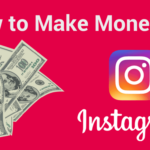 Affiliate Marketing Instagram Is A Winner For Your Business!